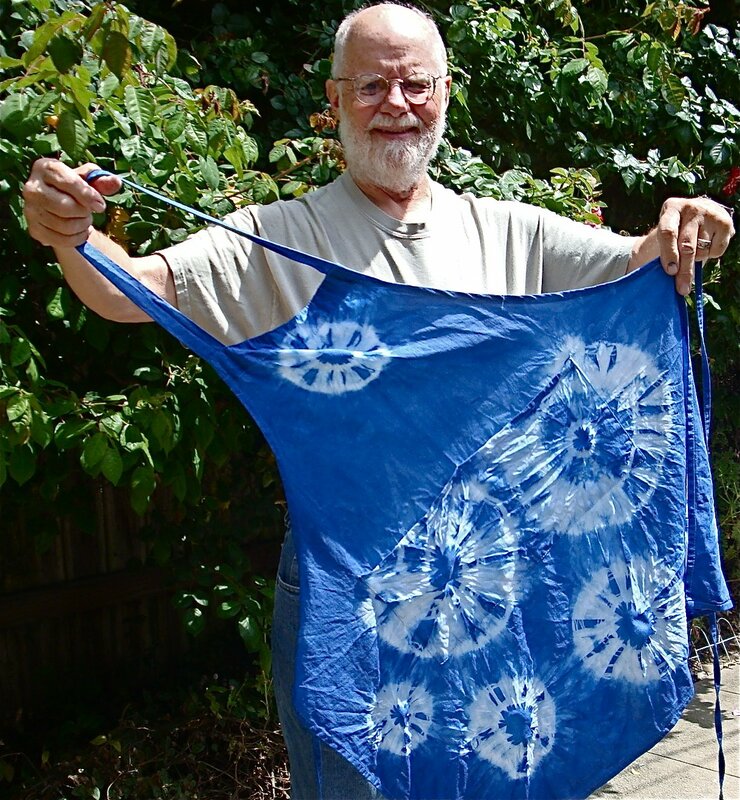 We have a two part video on YouTube with Bjo walking us through the indigo crystal dye process! STORAGE: These natural crystals oxidize in air, so store in lidded, labeled jars, in cool dark area. 9 – 10 pH for cotton & linen. Dye vat should be no hotter than 70º to 120ºF. You can even take it off heat & dye until the pot cools too much. DYE INSTRUCTIONS: WEAR GLOVES! Indigo will stain fingernails for a week or more. Fill pot with 3 gal water, heat to 70º to 120ºF. Add 2 T indigo, 2½ T soda ash, 2 T thiox – too much thiox is a bleach! Surface bubbles should be bright metallic shiny blue, metallic; not flat or dull-looking. Remove bubbles & foam with wet paper towel or damp piece of cloth wiped across vat surface. Wool & silk dyes in 3-15 min; cellulose fiber (cotton, linen, hemp, raimie in 20-30 min. INDIGO MANTRA: Dip – Rest – Rinse! STEP 1: DIP: Work fiber or fabric by hand below surface; allow to soak 10 to 30 min. then blue: This is normal for indigo. STEP 2: REST: Don’t rinse. Hang or just lay fiber on a surface for 15-30 min to let fiber completely oxidize (turn blue). Otherwise dye will not bond into the fiber. Wet dyed fiber always looks darker than dried fiber. STEP 3: RINSE: Don’t skip this step! Use ¼ tsp Orvus soap in rinse water, add fiber for 10 min to help indigo bond into fiber. This rinse removes unabsorbed pigment. For really dark color, return to vat for 30 – 60 min. Repeat all 3 steps until desired shade is reached. Fiber can be re-dipped, rested & rinsed as many times desired, until vat turns gray. SETTING COLOR: Don’t skip this step because it is necessary to set indigo in fiber! Wash in Orvus® or non-detergent soap 10 min or longer. Rinse until there is no cloudiness. Wash cotton twice in washing machine, separately or other fiber will be pale blue! It is normal for indigo to crock (rub off); it’s why indigo-dyed jeans wear in lighter areas. Too much oxygen in vat prevents bonding into fiber & tires vat. Oxygen will get in but try to avoid adding lots. Unbalanced vat: froth changes color, add 1 tsp at a time of calcium carbonate. CREATING OTHER COLORS: Strong blue overwhelms other colors. 65% to 75% red to 40% to 35% indigo for purple. Go to our online catalog for the supplies listed above, indigo dye history, kits, tie-dye instructions, mordant information & more! Questions? Contact us!